The snow ice cream recipe is fun to try in the wintertime when there's a white carpet of newly fallen snow on the ground, and the temperature is below freezing. Not only is this flavored snow a novel outdoor treat, but making it offers a fun activity for kids of all ages. If it's not wintertime or if you don't have access to a quantity of fresh, clean snow, you can prepare this frozen treat using shaved or finely crushed ice. Shaved ice is more hygienic if you are at all concerned about the snow's purity. You can make snow ice cream in your kitchen or backyard, on a winter camping trip, on a snowshoe hike, or even at an outdoor skating party. This is an easy kid's dessert recipe that's popular with children of all ages. Scoop 3 to 4 quarts of freshly fallen, clean snow in a large bowl and rapidly stir in 1 cup of sugar, some vanilla, or other flavoring to taste, and 1 to 2 cups of milk. Mix to desired consistency and serve while it's somewhat frozen. It takes only a few moments to freeze enough to eat. A richer version can be made using 1 cup milk and 1 cup coffee cream. Ice finely chopped in a blender may be substituted if snow is unavailable or you are unsure about how clean the snow actually is. Whereas the snow ice cream recipe makes a treat similar to homemade ice cream, this old fashioned sugar on snow recipe makes a treat that's more like a candy. It represents a popular springtime tradition that has been enjoyed throughout eastern Canada and the northeastern United States for centuries. Native Indians were the first to discover this sweet, candy-like treat and they taught the early French settlers how to make it. The Algonquin Indians called it and maple sugar sinsibuckwud. Nowadays, this maple candy treat is known as maple syrup on snow, maple taffy, snow taffy, or Jack wax, and in Quebec it's called la tire, which is a French-Canadian term for taffy or pulled toffee. Traditional sugar on snow requires maple syrup, which is derived from maple tree sap. The sap is harvested from maple trees in the "sugar bush" and taken to the "sugar shack," a rustic building in which the sap is boiled or "sugared off" in a large evaporator that can process over 250 gallons of sap in an hour. During the labored process, much of the water content is evaporated as steam leaving a concentrated, sweet-tasting maple syrup. It can take up to 40 gallons of sap to make just 1 gallon of pure maple syrup. 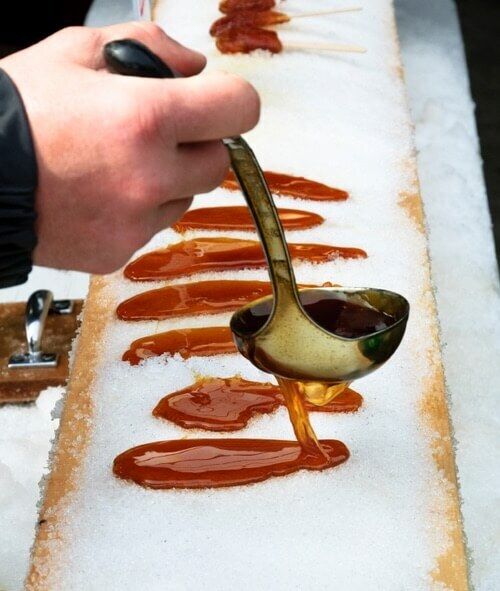 To make sugar on snow the maple syrup is further boiled to reach the "softball" candy stage (about 234°F or 112°C) and then carefully poured in a thin stream or drizzled onto fresh, clean, firmly packed snow and allowed to cool. It becomes an amazingly delicious, waxy, taffy-like candy that can then be scooped up and eaten with your fingers. Some New England residents enjoy eating it with doughnuts and dill pickles on the side to offset its sweetness. That's right, dill pickles! I've never tried it, but people claim it's delicious. I dare you to try it! If you cannot visit a sugar bush, you can always purchase some maple syrup and try this fun recipe yourself at home. Maple syrup can be purchased in most North American food stores and in some specialty shops overseas. It can also be purchased online at Amazon, in their Grocery & Gourmet Food section. Whether you try the snow ice cream recipe or make sugar on snow, you are sure to enjoy a wonderful time with your children and friends. These unique dessert recipes are excellent for use as a student science project, and they provide fun activities for youth groups and for people of all ages. Why not surprise your family with a fun, outdoor treat this winter?